Ruby and Charlee moved in with us not quite eleven weeks ago. They now have run of the house, except when they start tearing into the living room furniture and Gail shuts them out. Charlee (with the black triangle to one side of her nose) has settled in pretty well, after a slow start. Maybe a little too well. She insists on sitting with us when we eat and trying to jump on the table, no matter how many times we put her down. Ruby (with the white region encircling her nose) still keeps her distance, although she’s much more comfortable than she was for the first month. They do have each other. For the most part that’s a comfort. But Charlee does move Ruby out of choice spots every so often, and when they play chase, Ruby assumes the role of chasee to Charlee’s chaser. There’s no uncertainty about who’s in charge. Which they couldn’t have made more clear in assuming the pose above this afternoon. Hang in there Ruby. We brought Charlee and Ruby home six weeks ago. As instructed by the adoption organization, we confined them to a small space, gradually expanding their range as they acclimatized. Except only one of the sisters, Charlee, seemed to be doing much acclimatizing. 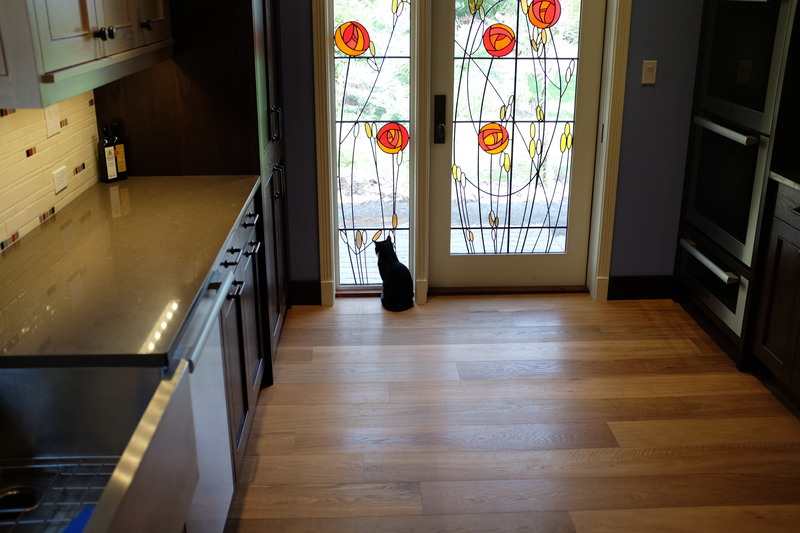 Ruby continues to be reticent, either by nature or as a response to her first adoption experience, in which she found her self in a home with an overly friendly dog. They started in a bathroom, then had run of a bedroom, then the bedroom and an adjacent bathroom, and then that space along with our master bedroom. Charlee took quickly to each expansion, Ruby less so. 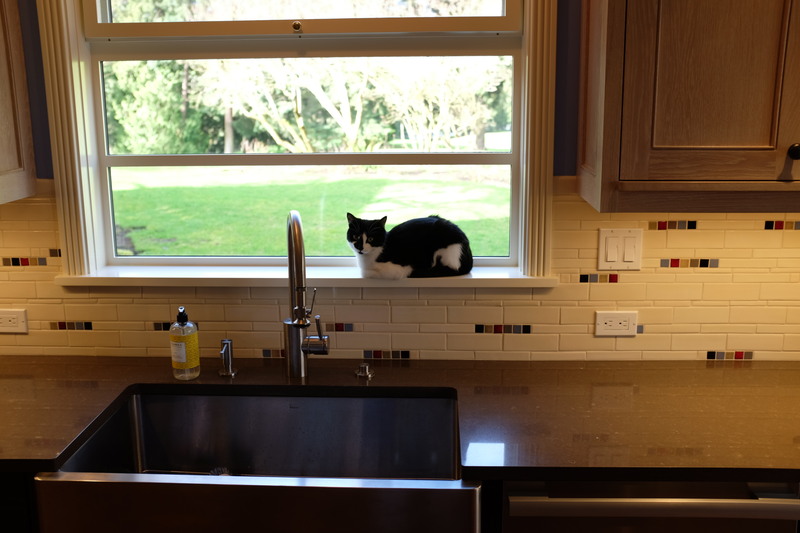 Eventually we extended their range during the evenings to part of the first floor, keeping them out of the kitchen remodel. Charlee would sit with us, occasionally escaping to the basement if we left the stairway door open. Finally, the remodel reached a point two days ago at which we could begin to use the new kitchen. It’s not finished. There’s a long list of items to be dealt with. But it’s functioning, and so we have been moving in. The cats too. You can see, above, how settled in Charlee is. She has made the kitchen hers. And below, Ruby is checking out the birds. However shy she is, she shares Charlee’s curiosity. She just doesn’t want us to be in the way when she’s exploring. Maybe they’re beginning to enjoy life. 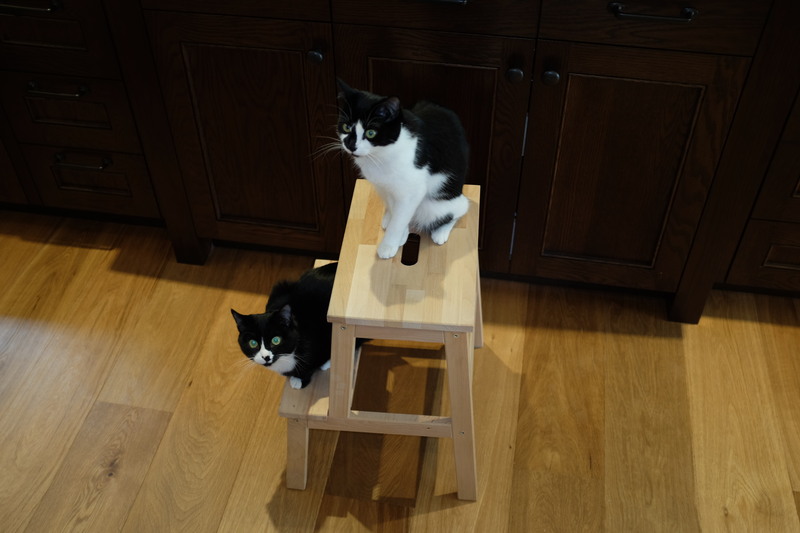 It’s not my intent to turn Ron’s Blog into Our Cute Kitties. But really, how can I resist? The eight-month-old sisters joined us twelve days ago. 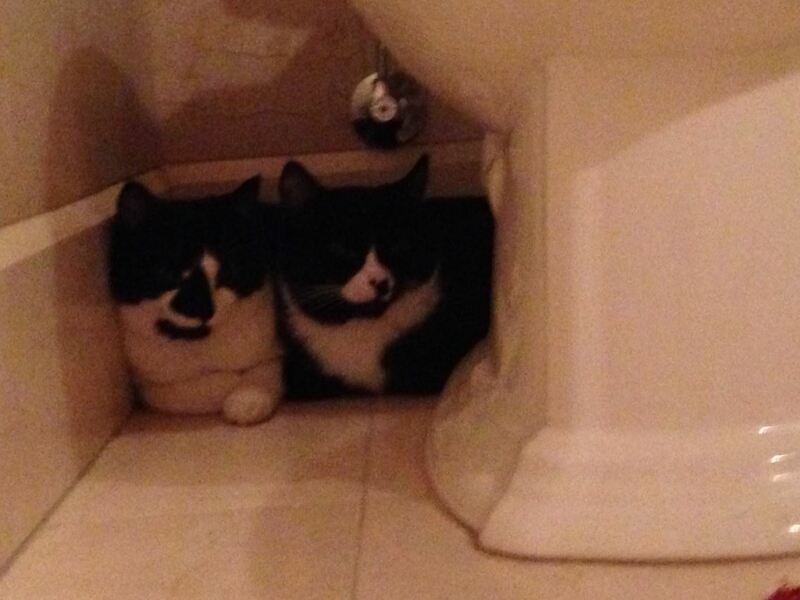 Under strict orders from Janice the adoption supervisor, we confined them initially to a small bathroom. Too small. 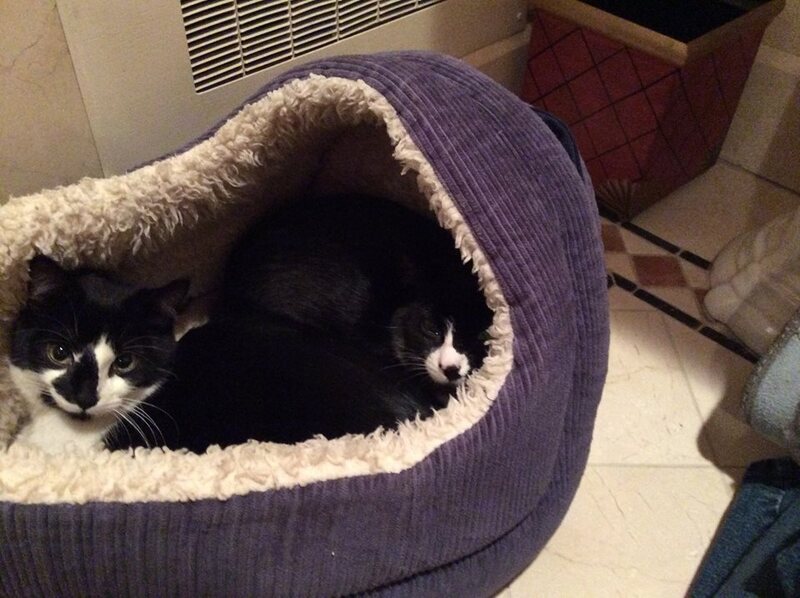 After two days ago, we brought them upstairs to a bedroom/exercise room. Now they range beyond it to the adjacent bathroom. Charlee—the girl with the black triangle nose—is full of energy, bouncing from room to room. Ruby is less comfortable with her surroundings. At least she now leaves the security of the carrier case. She’ll sit still when we enter their space rather than retreating. Charlee races away at the sight of us, then returns, maybe even sits on us (Gail anyway). 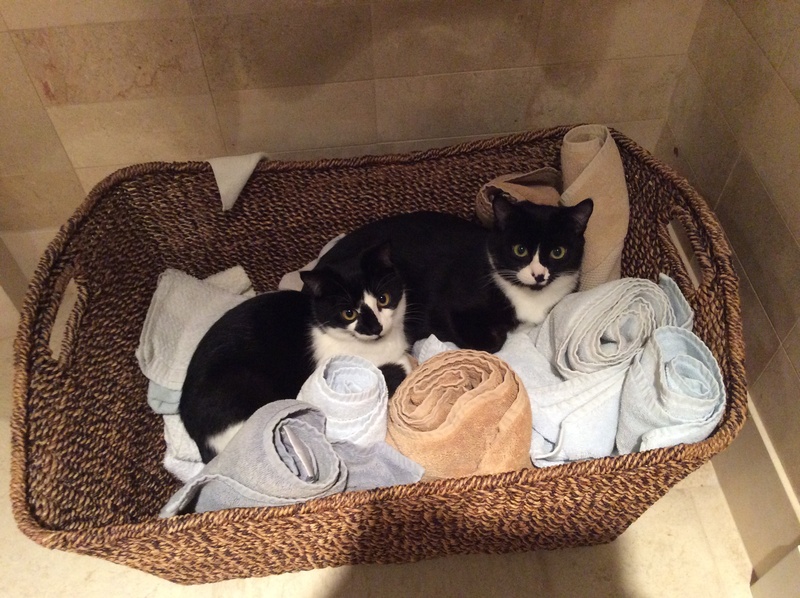 And now they’ve discovered the towel basket. I came upon the scene above on my return home tonight. It’s been seven months since we lost our sweet Emma. Gail has insisted that once the remodel is done, we will bring home new residents. I found myself in no hurry. But with the remodel showing no signs of ending, Gail’s patience had waned. When our friend Brooke mentioned on Tuesday that All The Best Pet Care on Lake City Way had two sisters up for adoption, Gail got it in her head that these were the cats destined to share our house with us. Gail called first thing Wednesday morning, thinking that even though it was New Year’s Day, someone had to be there to feed the cats. Actually, one of the store staff—Jen—had been their foster mother for two months, taking them home each night. Thursday Gail called again, confirming that the girls were still available. She and Jessica showed up in the afternoon. Friday, once I was done at work, we all (Gail, Jessica, Joel, and I) met there and spent 45 minutes with the cats in a special quiet room. They are 7 1/2 months old. Jen had named them Ruby and Rose. Until she came in to join us, they spent most of their time heading to the corners, but her presence calmed them. She told us that just a few days earlier, in discussing with Janice (the woman in charge of adoptions for the organization that had placed the cats with the store) what kind of family the cats needed, she posited that a professor would be a good match. And here I was, a professor. Providential for sure. Yesterday morning, Janice called the house and interviewed Gail for half an hour. The key issues were, don’t declaw the cats, don’t let them outside, feed them wet food. 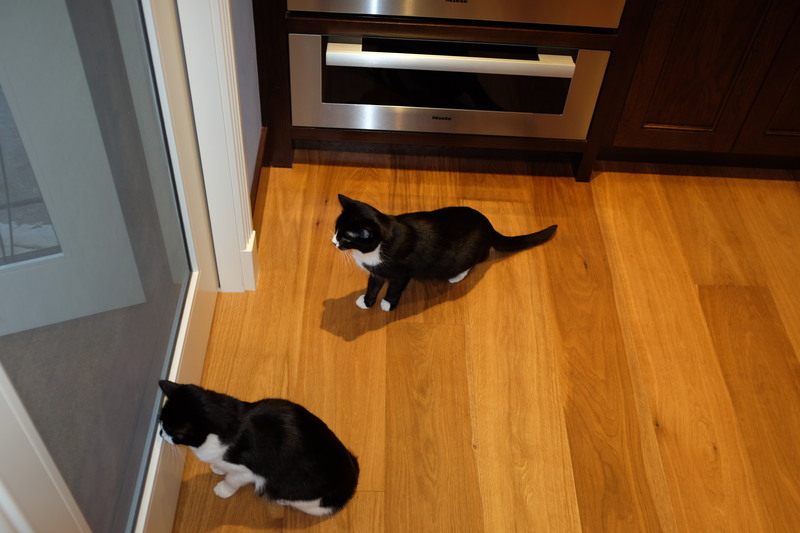 Once we got past that, the question of how to manage the transition arose, the woman insisting that the cats be kept in a small enclosed space, preferably a bathroom, to start their adjustment. We agreed. A few hours later, we were at the store, ready to complete the adoption. Food, litter, litter box, scoop, toys, treats. What else? Scratching board. A free throw-in: the bed they had been sleeping in. But the adoption fee had to be paid by cash or check. Oops. No one had mentioned that. We paid for the supplies, drove to an ATM, returned with cash, took the cats to the car, picked up a takeout dinner, and headed home. Gail put the cats in the assigned bathroom. I brought our dinner in, she set up their dinner and litter. We ate, checked in on them, and found that they had eaten in parallel, devouring all their food. That was 26 hours ago. There’s little to report since then. I can’t help thinking they’d prefer run of the house. There’s not much they can do in the bathroom. One of them made quick work of one of the toys, a stick with dangling feathers, tearing all the feathers off in short order. This morning, when Gail went in to spend time with them, they headed for the farthest corner, behind the toilet. This afternoon, my futile attempt to provide company drove them into the litter box. Better days await. If only our co-occupants shared our confidence in that. About a week ago, getting around became even more difficult. She was spending more and more time on her heated mat. Friday night, when I watched her head out the back door to the yard, her rear legs were noticeably stiffer than usual, and the next morning, she struggled to walk down the hall to her bowls. Thus, it was with surprise—and delight—that I watched her work her way down the stairs later in the morning and head out the back door. At which point the mean Stellar’s jay started harassing her, flying from branch to branch and screaming at her. Emma retreated under some shrubbery and hung out there for a while, then emerged, at which point Gail carried her back into the house. I opened the front door and she hobbled right out. Soon she settled into a location where we don’t usually find her, under some more shrubbery, as shown above. (Look closely and you’ll see her eyes.) There she sat in the sun and relaxed. We had some errands to run, so we left her there, where she was a half hour later on our return, and another twenty minutes after that. Then she came in and worked her way upstairs to her mat. In late afternoon, she came down again and headed out back. There was still life in her. The thing is, she wasn’t eating much, and on Sunday she ate nothing at all. Nor did she get off her mat. Yesterday morning, I went upstairs at one point and was surprised that she wasn’t on the mat. Gail and I searched the entire house. Then Gail went out the back door and the jay’s clicking sound was in evidence, suggesting that Emma was out there somewhere. 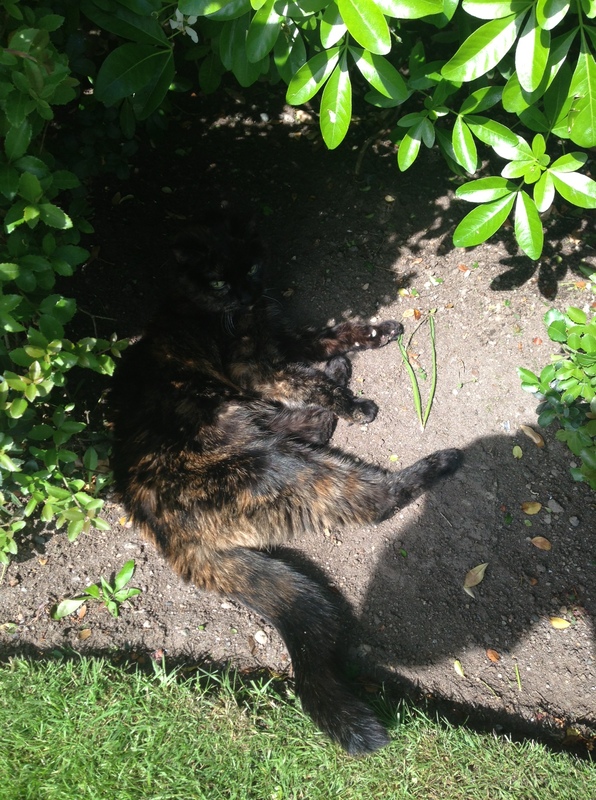 We looked under the shrubs again, but this time she was hiding in full view on the patio, sunning herself. Yet, she wasn’t eating, and walking was hard, so Gail made an appointment with the vet for this afternoon. I had some meetings I couldn’t re-schedule, meaning Gail had to bring Emma on her own. Emma weighed in at 4 1/2 pounds. The kidney disease we were warned about in its early stages two Decembers ago and in a more advanced stage last December had taken its toll. I got to the vet around 5:00, an hour and a half ago. Gail and Jessica were with Emma. We spent some time saying goodbye. As I petted her, she licked my wrist and made some noises. Still engaged in life, though no longer up to living it. 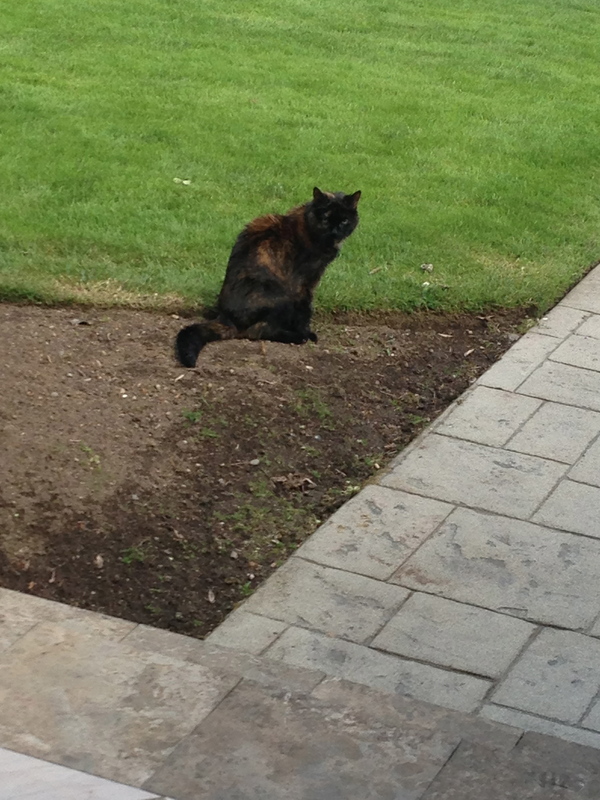 And now our dear, sweet, beautiful cat is gone. We miss you so much, Emma. A month ago, I wrote about Emma’s seventeenth birthday. I thought at the time that she had retired from active duty. But with warmer weather and longer days, she’s been resuming some of her outdoor ways, including a return to sentinel duty this afternoon outside the front door. She had been keeping a keen eye on passersby until I appeared in the doorway to take the photo above. A few evenings ago, she performed similar duty at her more familiar post in the backyard. Thanks, Emma. Good to have you back.